Your oral health is about much more than straight or sparkling teeth. Our office has now begun incorporating orofacial myofunctional therapy and training into our services. In simpler terms, we can act as a personal exercise trainer for your face, tongue, lips and breathing muscles, treating issues such as temporomandibular joint disease (TMJ), obstructive sleep apnea, incorrect swallowing, tongue postures and more with non-invasive techniques. All of these disorders can cause improper facial development, issues with chewing, swallowing and speech, and eventually lead to dental and orthodontic problems, such as misaligned teeth, gum disease, and tooth grinding. Orofacial Myofunctional Disorders (OMDS) such as tongue tie and mouth breathing, are also highly correlated with sleep breathing issues such as snoring and sleep apnea. A program of targeted myofunctional exercises can avert or prevent permanent damage, particularly in the developing child. In short, a healthy mouth requires facial muscles that perform correctly. A dry mouth is a cause of gum disease and, with the reduction of saliva, can lead to cavities. If serious and prolonged, it can cause facial development changes, such as long narrow face and crowded teeth and jaws. Mouth breathing can also lead to issues with sleep, anxiety, increased allergies, and colds, etc. This condition can push teeth out of alignment as well as cause eating, speech, and health issues. Myofunctional exercises are effective in correcting it. Treating underlying symptoms early can often prevent the need for braces later. The tongue exerts more force than braces, so it can help with orthodontic treatment if the tongue is moving and resting correctly. When the tongue is tied down for many years, it often has to compensate by making incorrect movements in the mouth during normal daily activities like speaking and eating. After any surgical correction, we can retrain the muscles to move or rest properly. With therapy, the child can overcome thumb sucking, pacifier dependence, and other habits that cause later jaw and bite alignment problems. Therapy can help correct these issues and improve general health, and alleviated facial and jaw pain associated with improper muscle movements during eating and drinking. Myofunctional therapy can often retrain the jaw muscles and help relieve symptoms of jaw joint dysfunction, including pain. Strengthening the muscles of the jaw, throat and tongue can improve sleep breathing issues associated with snoring and sleep apnea. These habits can damage teeth and gums; therapy can help correct the habits that underlie this problem. Myofunctional therapists are an important part of any dental medical airway team. Myofunctional Therapy techniques are often less invasive, and less-costly, way of treating many of the issues that lead to dental and orthodontic abnormalities, particularly when caught early. Even more important, this therapy can improve your general health with easier breathing, less pain, better skeletal development, and even a more attractive appearance. 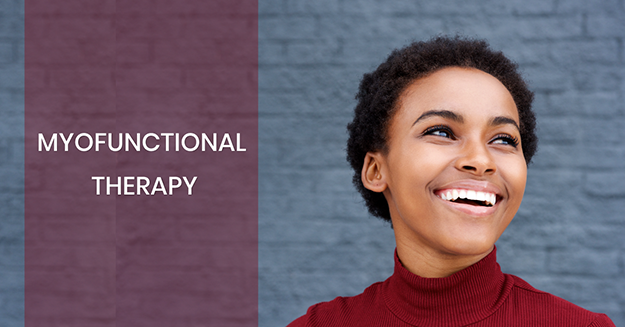 If you are a candidate for myofunctional therapy, our trained specialist will consult with you to determine whether this program will be of benefit. We think this therapy is an exciting new field that will enhance our patients’ treatment success. Feel free to call our office for an appointment or a consultation. Bruxism: Do You Grind Your Teeth? I used to hate going to the dentist. Mostly because I was constantly shamed about how I cared for my teeth. But Dr. Lamberton, Karla, and the whole team at Cosmetic Dentistry of Napa have made me love my teeth again. When I look in the mirror, I am proud of my smile! And I am thankful for this amazing office who helped me get there! Great service and professionalism! Went to Dr. Lamberton for a second opinion and wound up switching dentists. The work is the best, he refers root canals and other specialized work to accomplished endodontists, and he wound up actually being less expensive than my long-time dental practice. Plus the staff and atmosphere are wonderful. And, I have to confess, having Netfix to watch during time-consuming procedures is a great diversion.